Sargur Srihari applies pattern recognition expertise to developing computational tools that will make forensic shoe print searching more precise. (PhysOrg.com) -- A shoeprint etched in blood or dust can make a crucial difference in a criminal case, but it all depends on the ability of human examiners to identify a matching shoeprint pattern from thousands in their databases. It's a laborious, inefficient task. That's why University at Buffalo computer scientists are developing tools to make the search-and-match process more like a Google search and less like hunting for a needle in a haystack. The research is funded by the U.S. Department of Justice. 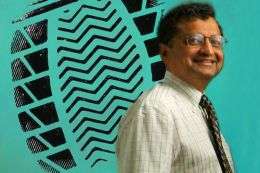 "Shoeprint evidence is some of the most widely available type of evidence at crime scenes," says project leader Sargur Srihari, Ph.D., SUNY Distinguished Professor in the UB Department of Computer Science and Engineering. But like many forensics fields, shoeprint analysis lacks a scientific basis. "It's a process largely based on human knowledge and intuition," Srihari says. Typically, shoeprints left by a suspect will be photographed or extracted from a surface and submitted to human examiners in criminal science investigative (C.S.I.) units. Those shoeprint images are then posted on Internet portals, where they are viewed by forensic experts around the world. The experts attempt to locate a match from thousands of shoeprint images in existing databases. "Analyzing shoeprints consists simply of human experts looking at shoeprints from a crime scene," says Srihari. "There are no formal techniques that examiners can use to substantiate a 'positive' finding one way or another. At the same time, bias can come into play and it's hard to disassociate that kind of knowledge from evidence you're trying to analyze." That's where Srihari's research will make a big difference. "We are developing algorithms for searching and matching shoeprints," he says. "We want to automate the process enough so that it works like a targeted Google search, where the query is the crime scene evidence and the match will be the list of results that help us determine which brand of shoe is closest to the print extracted from the crime scene," Srihari says. "The ultimate goal is to develop a software package that could narrow down the possibilities for the examiner to search." He and his colleagues at UB approached the problem by developing a large database of their own. They used shoeprints culled from shopping Web sites such as Zappos and others, which showcase outsoles of shoes as well as the tops. They classified the images according to the type of pattern they exhibited, such as circles, crosses, wavy lines, zig zags. "We downloaded about 10,000 shoeprint images from commercial Web sites," Srihari says. Then the UB researchers created their own version of a crime scene in their UB lab. They sprinkled talcum powder on the carpet and invited UB students, faculty and visitors to walk across the powdered surface, making impressions that they photographed. The UB scientists then converted the photographed shoeprints into a digital form that could be matched with images from the Internet sites. "The photographed shoeprints are our evidence," says Srihari. "Our goal is to see how well our algorithms function in matching the evidence to images in our database." He expects the UB research to yield quantitative results in about one year. Srihari cautioned that while computational methods are likely to improve the usefulness of shoeprint images in solving crimes, shoeprints do carry some drawbacks. For example, unlike fingerprints, which remain essentially the same, shoeprints may reflect uneven wear over a period of time and shoe treads may partially wear off, making the computational challenge more difficult. Still, he said, there are substantial advantages to be gained by better exploitation of shoeprints, since this type of evidence is quite readily available. Srihari also has applied his expertise to the forensic use of handwriting analysis, publishing the first scientific evidence that handwriting can be proven to be truly individual, given an adequate sample size. He brings to the study of shoeprints a career's worth of internationally renowned expertise in pattern recognition and the related field of machine learning. He directs UB's Center of Excellence in Document Analysis and Recognition (CEDAR), the world's largest research center devoted to developing new technologies that can recognize and read handwriting. CEDAR research includes developing methods for automated analysis of fingerprints and biometrics.